I have enjoyed watching television again without being assaulted by political ads bashing candidates. By the time election day arrived I was becoming numb to the ads. I feel a great sense of relief that it is all over. I'm not sure how the results are going to play out in results. I fear that we are looking at two years of governmental gridlock. I'm guessing that there will be at least one government shutdown as the two parties struggle for control. I remember seeing similar scenes in other countries while I was growing up. I never believed that it would happen here. Sadly, I fear that the rollercoaster ride is just beginning. It has started with the discussions and posturing about who will be the next Speaker of the House. I am concerned even about this since the party of the incoming majority cannot seem to agree on where to start with this issue. 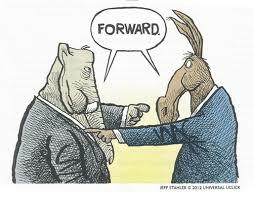 Personally, I would like to see a clean start and a bipartisan approach, alas, that is not likely to happen. While at least I don't have to suffer through political campaign ads, I have to keep seeing it all play out in the news.